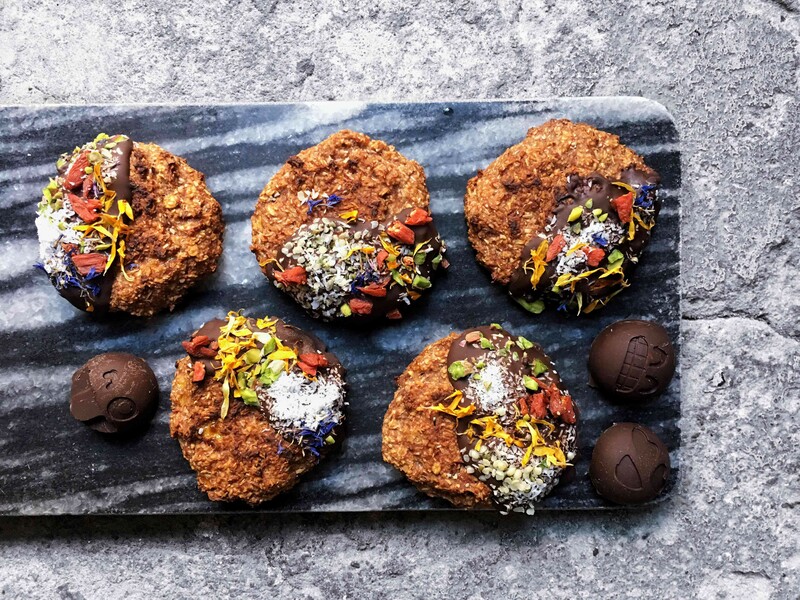 Healthy cookies free of oil, refined sugar and (optionally) gluten don’t sound like much of a treat, but don’t be fooled, these cookies are as delicious. 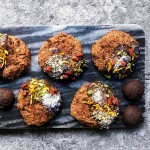 These cookies are sweetened by natures bests, apples, bananas and dates. The reason these are optionally gluten free is because of the use of oats, although oats are naturally gluten free, because of cross contamination they could contain some gluten. But rest assured as you’ll probably find gluten free oats in your own grocery store, just be sure to check the label. If you’re still not convinced let me tell you something! These cookies are a slightly crisp on the outside and deliciously chewy and sweet on the inside. Not only are they extremely delicious, they are also really simple to make. It’s a one bowl recipe that even the most unexperienced chefs can make. 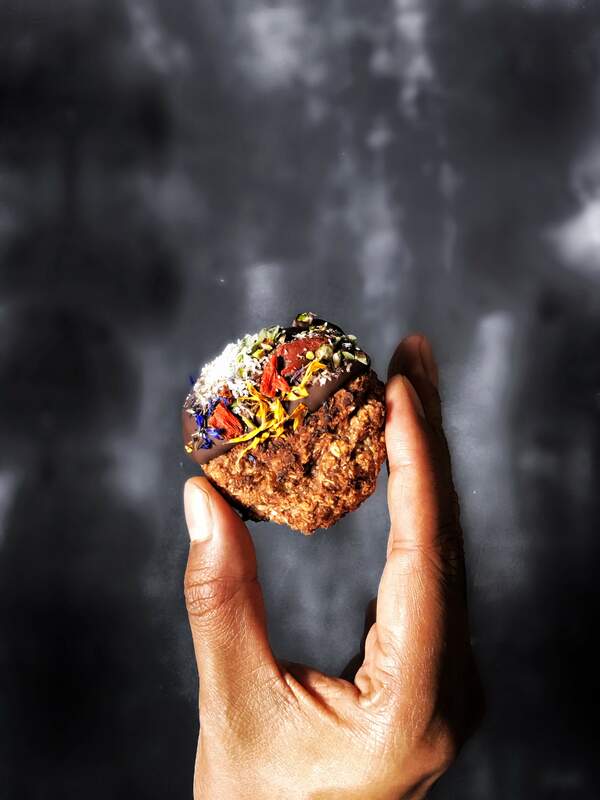 Have them as is for a super healthy cookie, or go all out with some chocolate and delicious toppings to create an indulgent semi healthy cookie. Heck scrap the semi healthy non sense, these are still healthy compared to your regular everyday chocolate covered cookies. 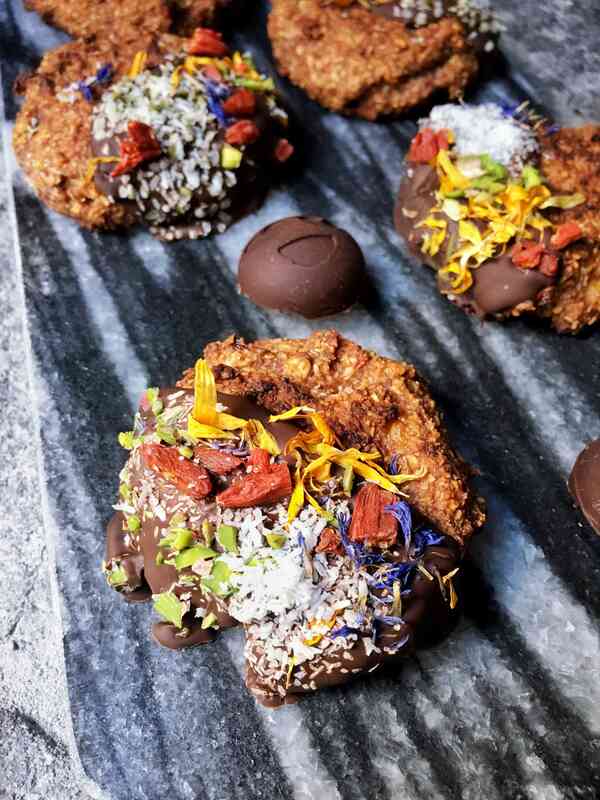 After covering them with chocolate I topped them with some chopped pistachio, desiccated coconut, dried goji berries, hemp seed and dried flower petals to dress them up, and adding some extra nutrition to outweigh the chocolate (pretty sure it doesn’t work that way, but heck, why not!?). Store these in an airtight container and they’ll last you for about a week, but trust me, they’ll be long gone by that time. These oatmeal cookies are the real deal! Come get your sweet fix. 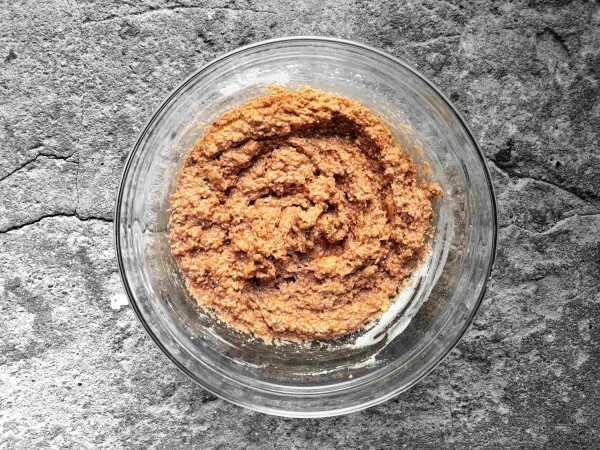 Preheat the oven to 175 Celcius or 350 Farenheit Start by mashing the bananas in a bowl, add to these the ground flax seed, apple sauce, vanilla and date sirup and mix well. Once mixed add the desiccated coconut and oat flour and mix well. 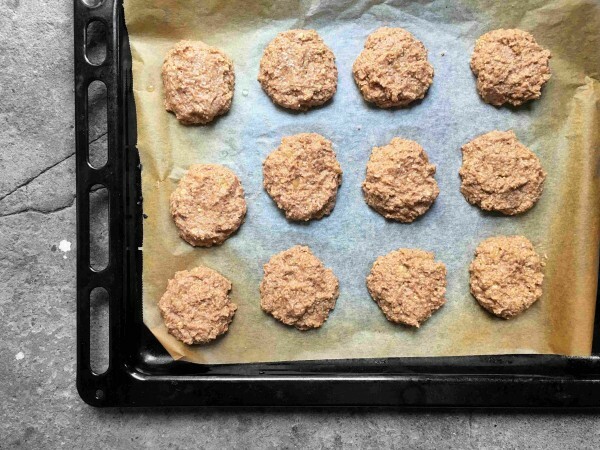 Line your baking tray with a piece of parchment paper and add the cookies to the tray. The batter is quite soft so you'll have to shape them into cookies of you want them to be round. Bake for 20 minutes before flipping, now bake another 15 minutes, remove them from the oven and let them cool completely. Enjoy! Melt chocolate over a double boiler and once melted place the bowl with melted chocolate in an ice or very cold water bath (to temper the chocolate). 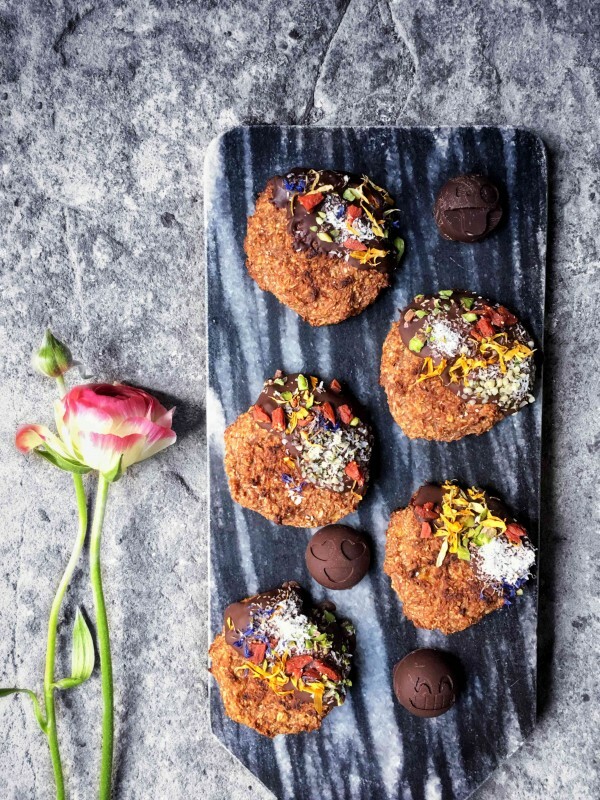 Now take your cooled cookies and dip them in the chocolate, put on a piece of parchment paper and sprinkle the chocolate with your decoration, or not. Let cool completely to harden. Enjoy! First of al, these cookies look like art, wow!! So happy that I found your website. As I am about to make these beautiful cookies, I was wondering which apple sauce you’re using. Do you buy it at the local supermarket or do you maybe make it yourself? I’m think that I will buy a jar at EkoPlaza (can’t go wrong with that right😜?! ), but I was just wondering which one you used for this recipe. Thank you for sharing your amazing creations with the rest of the world! Love, Sherani. So sorry for all the grammatical errors in my comment, I dont know what happened..